Can Biofuels Clean Up Chernobyl? It's definitely not advisable to grow food in southeastern Belarus. 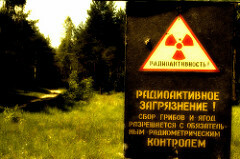 The region is still so contaminated by fallout from the 1986 Chernobyl nuclear accident that crops grown there will be unfit for human consumption for hundreds of years—until the radioactive isotopes decay. (Thanks to wind patterns during the disaster, which happened in Ukraine, about 70 percent of the fallout splashed over onto Belarus.) For years, Belarus has been racking its brains trying to figure out a way to decontaminate soil in the region—which is home to about 1.5 million people. And now an unlikely solution has emerged: biofuels. Fred Pearce has the full story. An Irish company, Greenfield Project Management, is proposing to plant sugar beets in the area and convert them into ethanol. The beets would be radioactive, but in theory, none of the dangerous material would get into the ethanol—it'd get distilled out. (Um, presumably there are ways of checking this.) The radioactive residue could then get disposed in conventional waste-treatment facilities. What's more, the beets themselves should start pulling radioactive material out of the soil, meaning clean-up could take just decades instead of centuries. Naturally, there are skeptics. Belarus doesn't actually have any facilities to dispose of the waste. Neither does Ireland. But, as Pearce reports, the soil situation is totally untenable and they need to figure something out, and soon: "A study in 1999 by Nick Beresford of the Centre for Ecology and Hydrology in Lancaster, UK, found that tens of thousands of people in the contaminated region are consuming dangerous levels of radioactivity in their food."